According to the CDC’s Autism and Developmental Disabilities Monitoring Network about 1 in 59 children, in the United States, have been diagnosed with autism spectrum disorder. 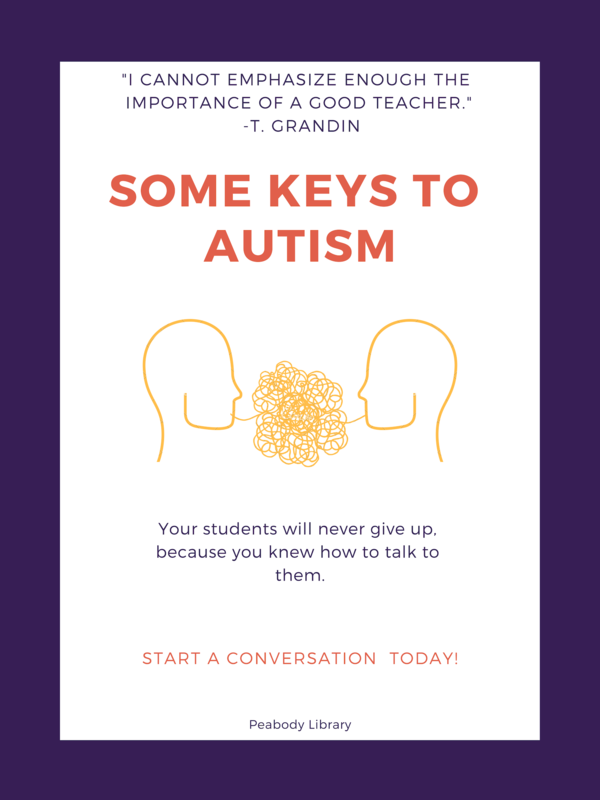 To help our patrons better appreciate the complex communication skills and needs of people with autism, Peabody Library’s new pop-up exhibit features some helpful books and other tools. The Peabody Library has items ranging from kits with hands on items, including animals, and picture cards, to youth books to help younger readers or siblings better understand, to books for teachers with classroom exercises, and books on how to grow with autism as a family and community. These items are all searchable in the Library Catalog. If you are interested in learning more about the materials available regarding autism, please contact Peabody Library. Thank you to Amy Corbitt for writing this article.